“Teaching your babies how to swim …. Babies stayed for 9 months in the mother’s womb filled with water ( amniotic fluid ) , hence its only natural that babies will feel at home when they are being brought back to the water environment . Its important to teach babies how to swim at an early age . In fact the earler the better for them . Babies are born genius and they can adapt very well to their surroundings . But why do we teach our baby Isabella to swim at a very early age ? Many parents out there worry that they might drown or gulp plenty of water which can be dangerous . There’s no doubt that you cant simply throw the babies into the pool and expect them to float by themselves . You need to know the technique on how to do it . Here are some tips on how we teach Bella how to swim and dive underwater at the age of 6 months . We started Bella at the age of one month starting in the bathtub . We filled the bathtub with water till it reaches upto the face covering both her ears while we lay down Bella and stabilize the neck to prevent her from swallowing any water . The idea is to make the baby comfortable in the water . Once Bella is comfortable which lasted for 2 weeks , we decided to go to the next step. We give Bella an instruction “ Bella , Ready , Go ! “ and we pour water with a cup of water onto her head and flowing down on her face . By doing this , the baby would start to know when to hold her breath . There are times when water goes into her mouth and the babies will start coughing . Stop for a while until they become comfortable again . We did this everytime its bathtime for Bella and that means 5-10 times of pouring the cup of water per session three times per day . The purpose is to teach Bella to hold her breath each time she heard our instructions “ Bella , Ready Go ! “ . By the time Bella is 4 months we knew she was ready to go into the pool . 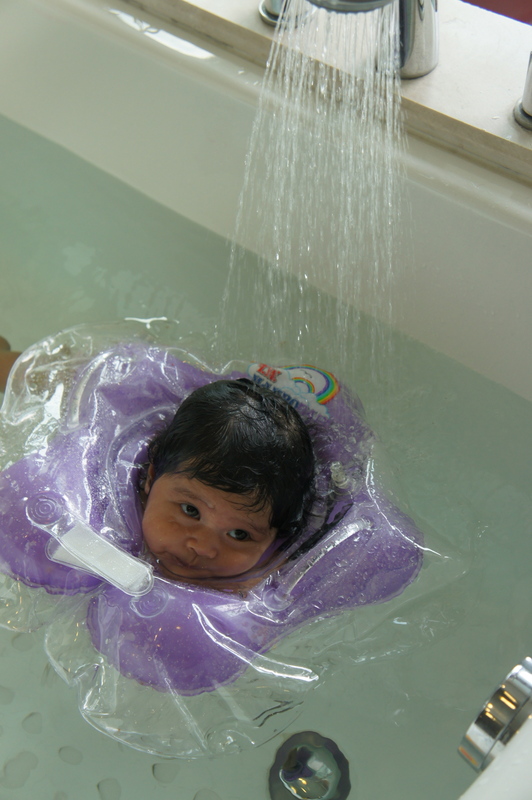 Bella loved the water as she had waterbirth . This eases our process to introduce her into the pool. Make sure the temperature of water is right . Wear a thermal cloth if necessary . If the baby is comfortable and not showing any signs of stress like crying , you can start the next step. By saying out loud “ Bella Ready Go ! “ bring the baby underwater for a short duration . As time goes by , you can increase them to 3 secs , 5 secs even upto 10 secs as how Bella is able to do now . But remember ! Safety to the baby is the top priority . And never leave the baby alone unguarded or unsupervised ….. Starting to teach the baby to swim has many advantages . It increases muscle tone, , bone development and even IQ ! Most importantly it might help the child to save their own lives or others in the future . Best of luck on your babies . While at the pool phase, we called up a professional coach to teach Bella since mommy is like a chicken in the water. Hhahaha.. To be honest, I was worried to put her underwater and daddy can’t be doing it alone. So, we decided to hire someone to teach Bella with daddy. That’s where Albert, Bella’s coach came in the picture. Now Bella is doing great underwater. Posted on May 22, 2012 by Dr Halina Mohd YunosPosted in MommyhoodTagged daddy writes, swimming. Next Next post: B’s First Haircut..
yes…bella really is a great baby, wish u many luck in the coming years ‘bella’, ‘mommy’ and ‘daddy’. GOOD JOB BELLA! yeah…i pun terlepas tgk nona as well.nasib ada tonton. yeah…me also tak sempat tgk NONa that day, nasib ada tonton. Dr, it is amazing tgk Bella really can swim with her daddy….. I already enrolled my baby to swim’ class… u inspired me more! and not to forget, it’s part of Sunnah Rasulullah S.A.W too. good job to both of u! insyaallah, i’ll start to teach my daughter soon. Sgt Hebat. Kagum dgn Dr. sekeluarga. great mommy! !~ great family.. may Allah bless u..
“since mommy is like a chicken in the water.. ” haha this line is so funny but kinda cute for me. just got my baby float last 2 weeks! very excited bring my baby to swim.. your baby bella is really awesome! air tak masuk dlm telinga baby ke?i takut betul klu air masuk dlm telinga.my boy sebaya dgn Bella. Okay je nampak dalam TV masa mommy dalam water tu…macam pro…mommy pandai coverline..hehehe! hehehehehhe kelakar la dr ni,mane ade mcm ciken.mcm pro ade la. isteri hebat untuk suami yg hebat..anak hebat daripada ibubapa yg hebat!!! Teruskan mjadi org yg hebat sbb sangat mbantu kami utk mjadi hebat mcm dr satu family…love u dr! Congrates Bella!! You swim like a pro lah in that picture with ur daddy! aduh..Bestnya! 1) http://elqashrinqaisara.blogspot.com –> all about me as a single mom who raised a daughter by myself and had my 9 month journey alone without husband. Please do view, comment and follow my blog. Ok? 2) http://prelovedbabyqueen.blogspot.com —> I have few used baby dress/shoes/etc that is still 100% in good condition and NEW item too. 3) http://queensenterprise.blogspot.com —> New Kaftan & Jubah for Hari Raya. Hello testing……why my comments aren’t here? I tgk Nona that day..sgt kagum dgn baby B..
terlopong dia tgk baby B dive..gud job gal!! shes a brave lil Bs..
such as adorable baby..bella..u go girl..
ohoho.. jelesnya tgk bella swim.. blh pinjam cekgu tak? hihih.. I wish I could learn swimming earlier. Until I almost drowned during white water rafting trip, I decided to learn swimming seriously at the age of 24. Ruginya tak belajari awal2. So good job bella. It’s great doc…utk sesi ngn Profesional Coach tu belajar kt mana? i ada tengok..sangat teruja tengok bella…and dr. halina still cantik jer…dr pun ada tangkap gambar dengan bella kan underwater…nanti tunjuk gambar sekali ok…. swimming pun salah satu yang nabi suruh belajar..berenang dan memanah. Salam, syabas Bella, Bella memang budak yang hebat. Auntie pun nak belajar berenang la lepas ni. Dengan ayah Bella (oops). Tersasul pulak. Bukan2 dengan Bella la. Maaf ya Dr Harlina bergurau aje. Little B looks like 5 years old. Look very matured & smart baby! ~Love love love to see her. I pun ada tgok nona last week..wahh..very impressive..congrats dr halina & dr SMS!! Really admire your style in educating ur little cutest B..
Masya Allah sis Lina, your family really inspired me. My friend nak ajar anak dia swim tapi most of the instructor refused to teach kids under 3yrs old. Kalau kat US, benda ni da biasa..cuma kita di Malaysia rasa mcm berenang di usia sgt muda dilihat terlalu bahaya, sedangkan ianya lesson yg sangat bagus. Cthnya org Bajau Laut pn akan campakkan bayi yang baru lahir ke dalam laut(rumah mereka kebanyakannya di atas air laut) supaya anak2 mereka tak takut dengan air bila meningkat dewasa nnt. #untunglah kamu wahai Bella punya parents seperti mereka!Subhanallah!!Allahuakabar!! doc, im interested with this..can u giv me the instructor numbr? Kat my condo pool.. Kire public pool jugak lar..
Sangat-sangat berharap suatu hari nanti anak saya akan jadi macam ni. Sebab saya tak boleh berenang, hanya boleh menyelam. Itulah kelemahan saya. harap-harap anak saya bolehlah tamatkan kemaruk nak berenang saya tu. kalau baby baru masuk 2 tahun still boleh ajar ke? Go to tonton.com.my Search for tv3 channel. Then go to Nona2012. Cari episode 21..
salam doc. bella tak kembung ke? sy risau laa nk try. how? untungla bella… comes from great mommy and daddy! Dumbbell Aspect Lunge and Contact will be the next movement inside your Spartacus workout program. because you have several options to choose from. Awesome! Can I have Albert’s contact details? I would love to teach my baby to swim! Hello there, can I have the trainer number? Im currently searching for infant swimming trainer. To my disappointment, most of the website claimed that they have the program is actually a lie. Some of them even laughed during the conversation. I believe they’re still living in stone age era. So please tell me how can I get the swimming trainer for infant.